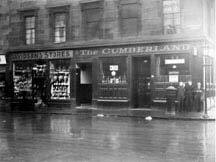 278 Cumberland Street, corner of 3 Camden Street, Gorbals, Glasgow. The Cumberland sat at the corner of Cumberland Street and Camden Street. There has been a pub on this site from the 1870s owned by Mr William Fraser. Mr Fraser was very successful having five licensed premises, Cumberland Street, 333 Paisley Road at the corner of Pollok Street, 10 Clyde Place, 178 Eglinton Street and 164 East Milton Street. Another name this old pub had was the Oak Tree Bar. From 1895 his son David Speirs Fraser ran this pub along with his empire of licensed premises in the city of Glasgow, including 333 Paisley Road, 307 Eglinton Street, 129 Govan Road, Paisley Road West, Rutland Cres, Crookston Street, 13 Eglinton Street, 307 Eglinton Street. Edward Anderson acquired the licence in 1909, he served the public here until the end of WW1. The Cumberland was owned by the McCabe family of publicans from the 1940s. The pub was demolished in the 1960s along with many of Glasgow's well known public houses. The Beehive, 183 Cumberland Street. Teachers, 90 Cumberland Street at the corner of Salsbury Street.